who plan to visit Japan and who are interested in Japan. I found many cultural differences and I am very interested in them. So, I would like to inform our culture to foreign travelers. and I am sure you will enjoy knowing and traveling in Japan. I will add the information little by little. I will try to enrich this site. Now, let's travel in Japan with me ! “Raiho-shin, ritual visits of deities in masks and costumes” were listed as Intangible Cultural Heritage of Humanity. Hidden Christian sites in Nagasaki and Amakusa region were listed as World Cultural Heritage. Sacred Island of Okinoshima and Associated Sites in the Munakata Region were listed as World Cultural Heritage. Festival floats of 33 festivals all over Japan were listed as Intangible World Cultural Heritage. The Architectural Work of Le Corbusier (National Museum of Western Art in Tokyo) was listed as 20th World heritage site in Japan. Sites of Japan’s Meiji Industrial Revolution was listed as 19th World heritage site in Japan. Washi (traditional Japanese handmade paper) was listed as Intangible World Cultural Heritage. I made an original tour to see the most beautiful sites in winter. Of course, I will be the tuide! The Tomioka Silk Mill and Related Industrial Heritage was listed as 18th World heritage site in Japan. Washoku, traditional Japanese food was listed as Intangible World Cultural Heritage. 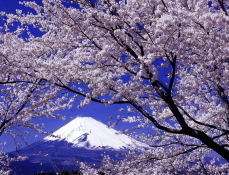 Mount Fuji was listed as 17th World heritage site in Japan. I think a lot of foreigners are afraid of coming to Japan after the earthquake, but people who came to Japan really enjoyed their stay without any anxiety. Here are some messages from the foreign tourists in April, 2011.